The building yard of the Flensburger Hafen GmbH is situated at the west side of the Flensburg port, next to the coal quay. There is a fully equipped working plant and a service quay for supply and works on the working platform. With this equipment – incl. 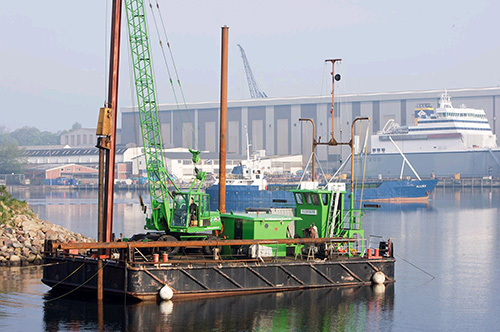 crane and ram – we are able to build up entire bridge arrangements and we also offer maintenance works for marinas and commercial ports. We are able to handle pales to a length of 18 m.
The Flensburger Hafen GmbH is well known for its services around the Flensburg Fjord. We are pleased to receive your inquiry.